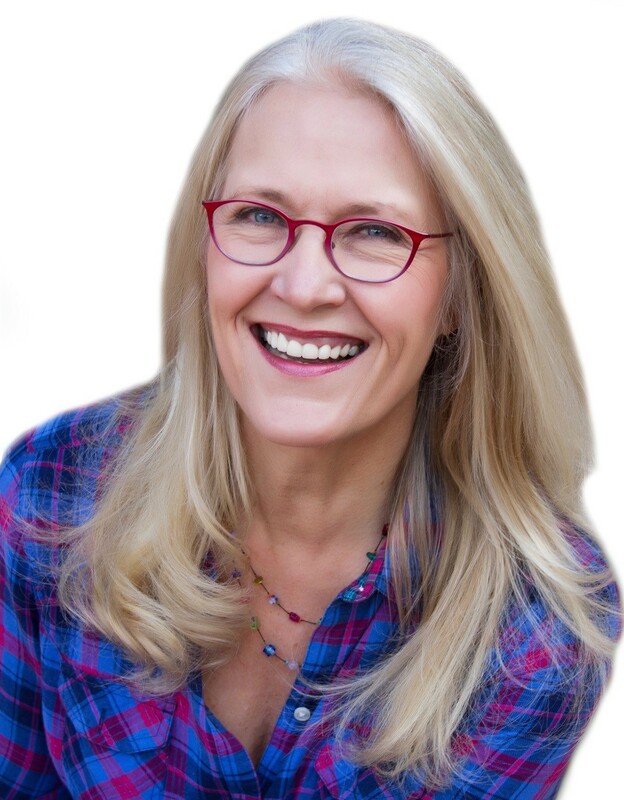 I just got back from the California AEYC Conference where I delivered workshops on “Art, Literacy & Brain Development.” The handouts from those workshops are posted here (you’ll see them on the right sidebar) for you to view or print out. To prepare for the workshops I taught several literacy based art lessons to a variety of children in classrooms that varied from ages 3-5. It was fun leading children through messy art ideas that had a literacy connection, and once again I included the X-Ray Handprint in some of the lessons. These photographs were taken from a Kindergarten class, and the video clip shows a wonderful close-up of a child doing the final phase of scraper art, which reveals her handprints. Take a look! So many of the conference attendees were excited to learn about X-Ray Handprints, so I decided to post these new photos here. See my previous post from Tuesday, Dec 14, 2010 for more X-Ray Art ideas, or find the complete lesson plan on page 44 in Smart Art 2 (MOREART). It’s been a busy conference season so I’m a bit late on my monthly post. Thanks for waiting! If you sign up to be an Art and Creativity Blog subscriber, each new post will conveniently come to you as an email. That makes it super easy to get a stream of new art ideas for your classroom. Please subscribe today, you’d be doing me a favor by showing your support. Thank you! 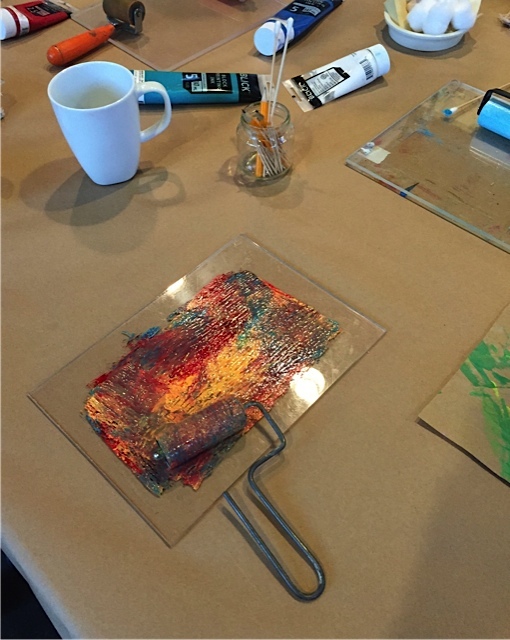 Watch how your hand prints seem to magically jump off the page, when you make x-ray hand prints using BioColor® “Scraper Art.” X-Ray Scraper Art is an amazing process, take a moment to watch the video clip recorded live at the Discount School Supply NAEYC Math & Science Workshop. I’ve also added a new “NAECY Handout” column at right which includes X-Ray Art as part of the NAEYC Math & Science Handout. Please consider printing out and sharing this handout at the next staff meeting! Teachers are always asking for new ideas that teach math and science through hands-on, sensory play. The handouts provided here are written with your “right-brain” in mind, they are easy to digest and rely heavily on diagrams and pictures. You’ll find the same applies to Smart Art Ideas Activity Book and Smart Art 2: More Smart Ideas Activity Book. These photos show 3-year olds making x-ray hand prints as part of teaching nutrition & building strong bodies. This activity provides a great opportunity to talk with children about the importance of milk, yogurt and other calcium rich foods in building good bone health. With that in mind, I added my favorite new science product, the charming little skeleton man (18″ Skeleton Model), which allowed me to reference an anatomically correct skeleton model as we began the activity by discussing our bones and hands. 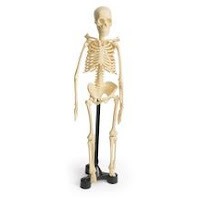 This incredibly inexpensive skeleton model is a must-have for science centers. I hope these photos inspire you to try x-ray hand prints with even the youngest of children. By giving the children a chance to create a colorful paint border around their hand prints, we ended up with delightful paintings that combine art and science in the best of ways. Recycle old CD’s and turn them into colorful picture frames, using BioColor® and your favorite photos. 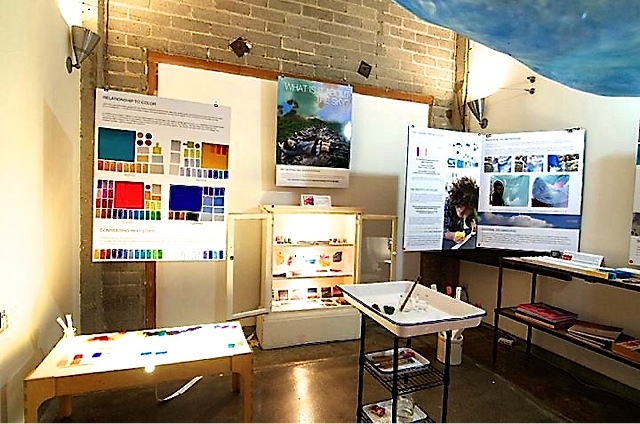 Since BioColor® sticks to plastic and other slick surfaces, it’s easy! Simply collect used CD’s and choose photographs with images that are small enough to cut out, glue down, and still leave enough room to add BioColor® paint. This recycled art project is easy, inexpensive, and unique! This first example shows a wedding photo created with a BioColor® design that lets the shiny CD peek through. After gluing down the picture, I used gold BioColor® to create a circular border, then I applied black and yellow BioColor® around the photo into a star shaped design. It hangs in a prominent spot on my wall at home, and is often a conversation piece. 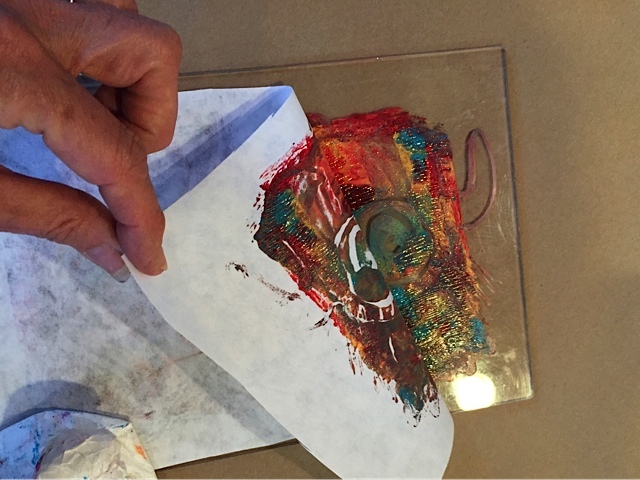 People love it when they realize the picture is simply glued onto a CD then painted. 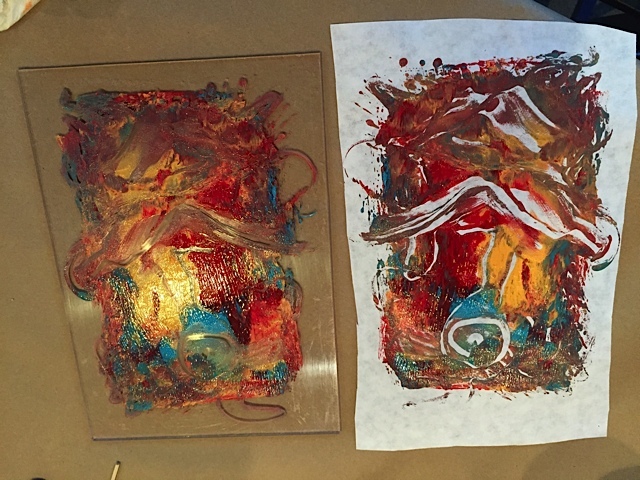 No other tempera paint will stick to plastic, so this recycled art project makes good use of BioColor®’s unique property of sticking to slick surfaces. These next two photo frames are simpler examples of the same process and could easily be created by younger children. Apply BioColor® using pre-filled plastic Nancy™ Bottles. When making a photo frame, it’s important to have something to hang the frame from. The easiest way to create a hanger is with a loop of yarn. Slip a 12” strand of yarn through the center of the CD hole, and tie it at the top. Now glue on your photo using tacky glue, and begin applying BioColor® any way you like. It’s easy to make dots of various colors, and a little more challenging to crea te lines, like the blue and white heart shapes shown here. Start with dots if you want to start easy. Drag a toothpick through the dots to create little swirly designs if you like. Apply BioColor® in dots and lines directly from Nancy™ Bottles, or use a paintbrush, or combine both. In this close-up you’ll see that dots were applied from Nancy™ Bottles first, then a paintbrush was used to spread around the paint and change the surface texture. You want a fairly thick layer of BioColor®, so make sure to lay it on a flat surface to dry overnight. Another fun idea for Recycled CD’s is to make Dream Catchers using BioColor®, feathers, and collage materials. Traditional Dream Catchers hang over beds and “catch bad dreams” before they bother your sleep. Authentic Native American Dream Catchers can be very intricate and beautiful. These playful imitations, or what I like to call “Urban Dream Catchers,” are a fun way to imitate the real deal. Lastly, here’s a picture of my workspace before I began making some of these samples. This recycled art idea has easy set up, and uses very affordable supplies, probably no more than 10 cents per project. And if you’re like me, you have dozens of old CD’s stacked around, just waiting to come to life as something shiny, fun and artful. For more ideas on how to use BioColor® on slick surfaces check out this video! 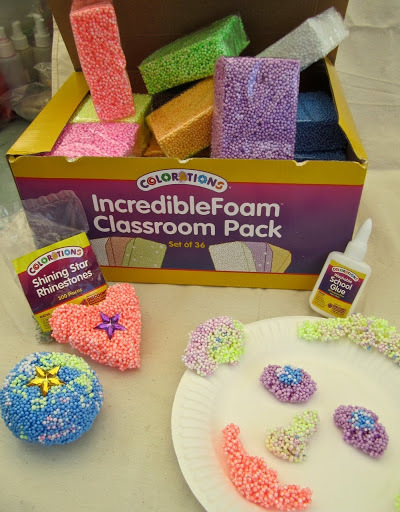 IncredibleFoam® Dough is a light modeling compound (think substitute for clay) that’s wonderful to touch, squish, and sculpt into 3-Dimensional Art. It comes in dozens of colors and it’s an inspiration for creative young minds, like 4 year old Jordan pictured here. Does he look proud of himself or what? 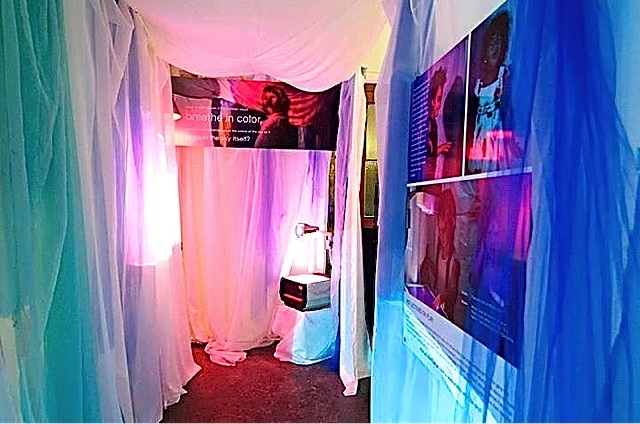 Jordan came up with this idea on his own, by pressing several colors of Foam Dough onto an 11″ x 17” piece of construction paper, then later gluing down the pieces with white glue so they’d stick. Foam Dough also makes a great Small Group Activity, as illustrated by this collaborative artwork. 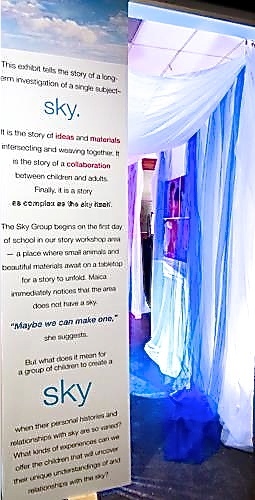 A small cluster of school age students created a picture by working together and pressing Foam Dough onto the tabletop where they were seated. Each child was given a different color of Foam Dough to start, and they were asked to work cooperatively to decide on a theme and create one unified picture. I loved the result, as well as the teamwork it inspired. Whether you apply Foam Dough to paper, or shape it into a freestanding 3-D sculpture, it looks great and is always easy and fun to work with. And did I mention it doesn’t make a mess? Foam Dough is clean, soft, and mess-free, yet it’s also completely open ended so it brings out children’s natural creativity. Plus, it never dries out, even if you forget to bag up the leftovers. Experiment with it yourself, and you’ll find that IncredibleFoam® Dough holds lots of discoveries. It even floats! Imagine making little boats for your sand and water table, or combine it with collage elements like the Shining Star Rhinestones, Sparkle Stem Pipecleaners, and Colorations® Washable School Glue pictured below.